From the very earliest days of our nation's history, liquor has played a role in American life. By the mid-1800s, however, some began to take note of excessive drinking and so launched the temperance movement. Originally intended to reduce liquor consumption and public drunkenness by encouraging moderation, eventually proponents called for a complete ban on alcohol. Although many laughed off the efforts, eventually the idea took hold and resulted in the eighteenth amendment to the constitution, which prohibited the production and sale of alcoholic beverages. 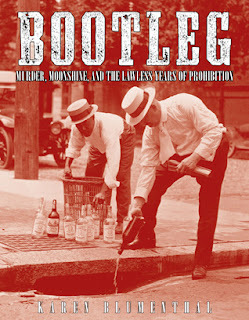 Bootleg recounts the story of this movement, the strange decade of the 1920s, and the eventual repeal of Prohibition. Prohibition was clearly a very loosely enforced set of laws, which brings home some important points about legislation and social culture. Although the constitutional amendment passed, buy-in wasn't strong from law enforcers or the general public. For it to work, the larger culture would have had to change. Before the law, everyone drank and heavily, including small children. Parents even gave liquor to babies, and doctors and pharmacists regularly prescribed it to patients. Once Prohibition went into effect, the only thing that changed was the quality of the liquor and the difficulty of getting it. Instances of drunkenness reportedly went down, but all sorts of mayhem took its place and the result was illness from bad booze, the rise of organized crime, and more than a few murders. I couldn't help but think about gun control while reading this. The two issues are very different in a lot of ways, but what is the same is that both alcohol and guns are deeply embedded in our culture. As much as you may to rid ourselves of the disastrous effects, outlawing something that is such a part of people's lives just isn't going to be very successful - the culture itself has to change. This book was chosen for my Not-So-Young Adult book group at work and it's our first nonfiction selection. Under 150 pages (not including the glossary and bibliography), this was a great overview of this fascinating time in history, packed with information and photos, and written in a clear, simple style. This is exactly how I like to read nonfiction.